More than 20 years since the disappearance of Kristin Smart, the San Luis Obispo County Sheriff’s Department is excavating a hillside near the Cal Poly “P” in a search for Smart’s remains. The sheriff’s department learned that Smart’s remains may be buried on the Cal Poly hillside. FBI then brought trained cadaver dogs which alerted to several locations near the Cal Poly “P” landmark. Investigators are performing an excavation that is expected to take up to four days. A command post is being manned by 25 FBI agents, 15 members of the SLO County Sheriff’s Department and California Department of Fish and Wildlife investigators. Flores, who dropped out of Cal Poly after Smart’s disappearance, was the initial focus of a police investigation. He has since left the area and is believed to now be living in southern California. He remains a person of interest, according to the sheriff’s department. He has never denied any involvement in Kristin’s disappearance. Smart’s parents, Denise and Stan Smart of Stockton, took a civil case of wrongful death against Flores in 2005, but dropped it after Flores pleaded the fifth amendment in court. Flores has been arrested for DUI three times since 1997 and was sentenced to 240 days in jail for violating his probation after the last DUI. 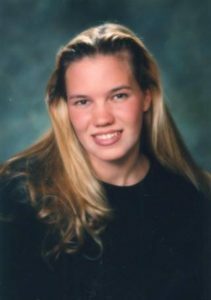 Kristin Smart was declared legally dead in 2002. I have to agree even the biggest baddest football player would have a heck of a puff hiking even 100lbs up that hill. KSBY is reporting that items of interest found at the dig site. Could be nothing, but then again, it could be something. On my browser, your link led to: Page Not Found. This case was bungled by campus security who are low level (mall security) types and brushed off her missing status as a probable hooking up, will show up status. Because of the mishandling in Kristens case, new legislation passed a bill titled the Kristen Smart campus security act. The law took effect on January 1, 1999 and requires all public colleges, and other publicly funded educational institutions to have their security services make agreements with local police departments about reporting cases involving or possibly involving violence against students, including missing students. Jana, I like the way you think, but a cadaver dog hit on Paul Flores’ room so it’s most likely she was kept there until he was able to move her. For those of you who have questions about this case, how the sheriff’s department became involved and what the most likely theory is, here is excellent article by L.A. Times reporter Peter King. Gordo, on my browser, your latimes.com link led to PAGE NOT FOUND.